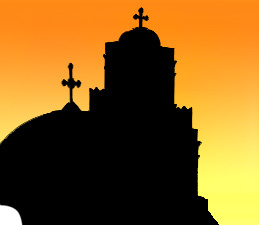 The Orthodox Church of St. John the Theologian began in 1983 with the intent to provide an English-language Orthodox presence in the eastern end of Suffolk County, Long Island, an area containing over a half-million people. The establishment of the mission was the dream of Father John and Matushka Marie Sochka of St. Andrew Orthodox Church in Dix Hills, who envisioned the establishment of such a “daughter parish” back in the ‘70’s. After Fr. John’s untimely death in 1980, Matushka Marie and several other member of the Dix Hills parish who lived out in the Town of Brookhaven got together to organize the “Yaphank mission” and saw the first Divine Liturgy served on Sunday, December 11, 1983 at Yaphank Presbyterian Church. Choir responses were handled by the seminarians of St. Vladimir’s Seminary, Crestwood, New York, and Fr. Tom Hopko, Professor of Dogmatic Theology at St. Vladimir's, as guest homilist. During this time, the community sponsored numerous spiritual and social events such as the Yale Russian Chorus and summer picnics to bring a geographically scattered community together for Orthodox worship and fellowship. Fr. Stavros Strikis was assigned as the first priest of the new mission and worked hard during the first year to establish as regular cycle of worship. Following Archbishop Peter’s visit in September of 1984, the mission was officially established as the Orthodox Mission Church of St. John the Theologian, Yaphank, New York. A strong core of approximately twenty to thirty people led by Fr. Stavros proceeded to continue services at Yaphank Presbyterian Church. Fr. Stavros remained until 1986 and was succeeded by Fr. Raymond Courtney, for two years, Fr. Bogdan Djurdjulov, for one year, and Fr. Basil Prisacarou, who served until April of 1993. Father Jonathan Ivanoff, a 1986 graduate of St. Vladimir's Orthodox Theological Seminary, was subsequently assigned to the mission in May of 1993. Through consistent effort and focused outreach, a team of dedicated and talented lay leaders working with Fr. Jonathan in the area of education and teen youth work, evangelization and mission, and parish organization and administration were able to begin making a difference in the physical, spiritual and social life of the parish community. Within one year, membership had doubled to thirty-eight adult members. A church school was started in the fall of 1993 with six students and finished the year with eleven students; during the following church school year, enrollment began with fourteen children and ended with seventeen. A youth group was started with over a half-dozen teenagers enjoying monthly fellowship as well as spiritual and Christian social formation. By the beginning of 1995, parish growth necessitated a move out of Yaphank Presbyterian, who had very kindly and gracioiusly served as our host since the Mission’s first service in December, 1983. A five-month term at the Mouse Hall in Miller Place was followed by a year at St. Mark’s Lutheran Church in Ridge, who invited the Mission to begin services, at no charge, in their facilities until St. John’s was able to find property of its own. Beginning in 1995, the Mission undertook a concerted effort to finally identify and locate suitable property for its own use. By the beginning of 1996, with adult membership exceeding fifty and the church school program enrolling over twenty children, a successful capital campaign raised over $60,000 to purchase such a place, and in April of 1996 we moved into our present facilities at 158 West End Avenue in Shirley. The mortgage was paid off in 2006 and an extensive construction renovation project was carried out in 2014 that will allow us to grow and do even more to expand both our faith and our mission in the community.